So here we are at the end of February, and I’m only just recently starting to pull myself together for the 2018 Block-a-Month Crochet Along (or bamcal for short) group on Ravelry. These past couple of years have found me so busy that I’ve barely done any crochet at all (well, from what I’m used to). But I’m really hoping that will change. I’ve been in nesting mode – it’s true, we’re expecting another sweet little one at the end of spring. My heart is swelling with joy, and we’re all so happy. And chances are that this will likely be my last little one, so I really want to take all the time in the world to enjoy every last minute of being a mother to an infant. Clara has been a dream of a baby – easy going, a good sleeper, calm. I’ve really been blessed with her, and she just bubbles over with happiness and love for life. I’m hoping that she will embrace being a big sister just as much as she embraces everything else. My older boys, too, have stepped up to the plate so much to help – watching Clara when I need to nap, helping with feeding when necessary, and entertaining her when I need a few minutes to myself. That’s one of the reasons why I have had a bit of extra time to myself. Although I’ve spent more time than necessary on cooking and cleaning, I’m making sure lately to see that I am also getting time to create, even if it’s just a round here and there of crochet, or doodle on the sofa while I’m nursing. And so, I’ve fortunately been able to start catching up with the 2018 crochet along. So here I’m sharing the first three January squares for the 2018 crochet along. The first one here is called Grumpy Grandad square by Sadie Cuming, found for free (as of this writing) here as a Ravelry download. I added a little bit of decorative embroidery in the center, just because, and went a little crazy with the blocking, because the lines of this are so striking. I’m using my new colors for this year’s bamcal, which are from the Caron Simply Soft line. The colors are white, soft green, blue mint (from the brite line, as the deepest blue), and robin’s egg blue for the midtone blue; the lighter pinkish color is the same light country peach that I’ve used in previous bamcals (and which I stocked up on when I thought they discontinued the color, but now it’s available everywhere again, so who knows!? ); and the deeper pink is plum wine. I was a little hesitant when selecting these colors because there’s such a huge trend right now in crochet with the turquoise/pink thing, but I think the contrast works well with the addition of the green and peach. The color flow is so soft and pretty. Sunrise Beach by Jen Tyler was the group’s choice for the filler square for February. The pattern is available as a free Ravelry download here. I love this square. Especially with the colors; it goes so well with the femininity of the ruffles, the floral theme, the embellishments and puffs. I really had a lot of fun designing the color layout and then making the square. 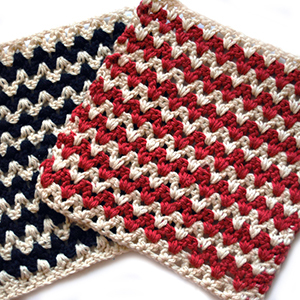 Both the squares are made for worsted weight yarn and come out to 12″ in the pattern. But since I’m using a sport weight yarn, I also use a smaller hook than is usually recommended as well. These were both made with a 4.00mm / G hook. Because of this, they don’t come anywhere near to 12″. In fact, I usually need to add a few rounds to get them up to 9″. But 9″ is perfect, because, as with my 2015 bamcal blanket, the squares are all in multiples of 3″, so I can mix and match them at the end of the year into a pleasing pattern. 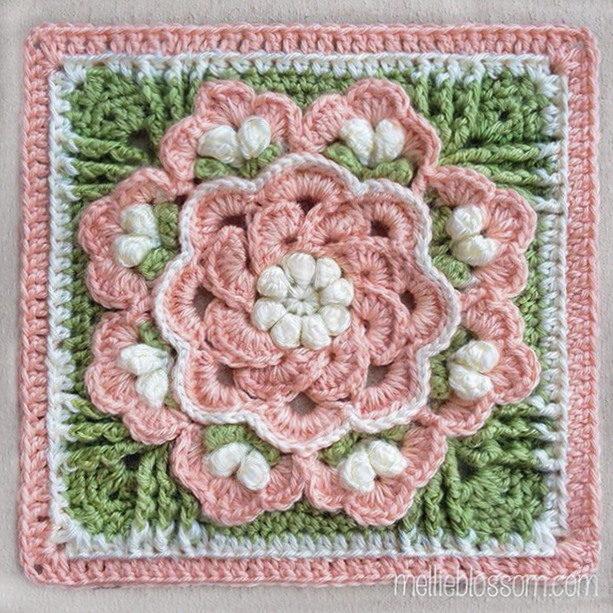 And finally, the 6″ square for January is Knotted Puffs by Amber Schaaf. This is another Ravelry download (also free) that can be found following the link here. These came out smaller than 6″ for all the reasons I mentioned above. Usually I just add a few extra rounds onto the squares to bring them up to 6″, but instead I did something a little different by putting them together into a 4-square and then adding the borders around that to bring it up to 9″. I’m sure I’ll have plenty of 6″ squares by the end of the year that a few of them can be pieced together like this just fine. Anyway, friends, thank you for all the comments and emails. Like I’ve been promising (and promising, I know), I will eventually get back to you and answer some of the questions that you’ve left. Thanks for all your support and patience, I truly do appreciate it!